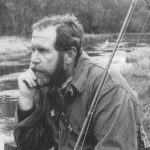 Here is a piece written by Dean Riphagen on the Henry’s Fork that was published on Tom Sutcliffe’s website. 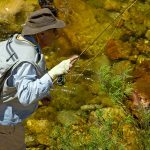 FISHING THE HENRY’S FORK – IS THIS ‘THE FINAL EXAM’ IN FLY FISHING MASTERCLASS? OR WHAT’S IT REALLY LIKE TO FISH THE FABLED ‘FORK’? 2012 marked the 10th year that we (Frontier Fly Fishing) have attended the International Fly Tackle Dealer (IFTD) Show. While our visits to the Show are strictly for business, the visit to the States is also a great excuse to tie in some fishing. Personally I’ve always favoured hitting the Show first and then leaving the best until last. This year the show was held in Reno, Nevada. Reno certainly wasn’t the best venue (in my opinion anyway) which historically has been held in Denver, Colorado. The Show seems to be getting smaller every year and this year it was very noticeable. It seemed there were more exhibitors manning the stands than retailers, wholesalers etc. It took the first morning to conclude my meetings with our major suppliers then I spent time checking out the stands for new and exciting products. Once I’d concluded my business it was time to pack up and depart Reno for Salt Lake City, Utah. Three years ago my good friend, Rowan Nairn, left South Africa to live and work in the States, as well as marry his American wife. Rowan, mostly called Stan by his good friends (after the character in the South Park television series), was waiting at arrivals in Salt Lake City. Like all good friends, distance and time had had no affect on our friendship. It was like nothing had changed, that we’d never been apart. After exchanging handshakes it was off to the nearest pub in the airport to have a few cold ones while we waited for our connecting flight to West Yellowstone, Montana. I guess one of the real eye-openers in the States is the number of fly-fishermen you’ll see. Wherever we were in the Salt Lake City airport, we saw anglers carrying rod tubes. And with all the water available it’s understandable why so many anglers fly-fish. The flight from SLC to West Yellowstone takes you over some amazing countryside, and as you near the greater Yellowstone area you start to see more and more water that just screams “trout”. West Yellowstone, or “West” as it’s simply called by most fly-fishermen, is one of the prettiest towns in the States and if Rhodes is the centre of the fly-fishing universe in South Africa, then West Yellowstone is the centre of the world’s fly-fishing universe! In this small town you will find seven, yes seven, fly-shops, some that have been around longer than I’ve been living. Like Bud Lilly’s Trout Shop, Bob Jacklin’s Fly Shop, Craig Matthew’s Blue Ribbon Flies and Madison River Outfitters are just a few that come to mind. On arrival we collected our hire vehicle, a huge Ford F150 pickup truck, and headed into town to purchase our State fishing licences. The first shop we saw, and one that I had previously been into, was Craig Matthew’s famous Blue Ribbon Flies. Craig wasn’t there, but a youngster behind the counter got our licences squared away and then we got down to the nuts and bolts of where we could go fishing. The Madison, one of the West’s premier rivers, and one I’d fished before, was not fishing well out of Yellowstone National Park (YNP), and along with the Firehole and the Gibbon (below the Falls), was closed to fishing within the Park. The problem these rivers and streams experience is high water temperatures during August and into the early September. The Firehole, a world-renowned trout stream, flows through the Upper- and Lower Geyser Basins. These basins are full of geysers which pump hot water into the Firehole, making the river unfishable during certain times of the year. He suggested we fish the Lamar in the Park which sounded like a good bet. I’d never fished it before, but the river is well-known for its great cutthroat fishing. Along with the youngster’s guidance we selected a stretch of river which, on the map, seemed to flow away from the road running between Tower-Roosevelt and the northeast entrance to the Park. Since fishing pressure is a reality in the States we figured the further we fished away from the road, the better. After purchasing a couple of flies, which included some really realistic hopper patterns (August being the prime hopper month for hopper fishing) we departed to check into our motel and then headed out for a beer (a Montana Trout Slayer Ale was, appropriately, the first beer we drank in West Yellowstone) along with a steak. The following morning we were up early and entered the Park at 6am with the temperature a cool 34 degrees Fahrenheit (just above freezing). Reaching the section of the Lamar we’d decided to fish meant a long drive despite the fact that there was very little traffic on the road. The return journey later that day took us almost two hours thanks to the tourists in the Park who stop and look at every animal no matter how arbitrary. We reached the section of river we’d decided to explore and while tacking up, had bison (buffalo) walking past us on the other side of the road. A quick walk down to the river and we were fishing, and almost immediately spotted a rising fish next to a large rock. Rowan had the first throw at it but after a few casts the fish stopped rising. No matter, it was early in the day and the river looked in good shape, and we still had the rest of the day ahead of us. While we sat in the grass alongside the stream contemplating a fly change, an American arrived, asked after our success, then headed off upstream telling us that he would give us ample room to fish. He wondered off and proceeded to start fishing the head of the pool we were fishing! My blood and Rowan’s started to boil! Then his two mates arrived, walked past us, walked around a bend in the river and started fishing the pool above the one we were fishing. After a quick confab Rowan and I hitched our flies and started walking across the river’s floodplain. There was no way we were going to spend the day fishing behind three other anglers. We walked at a fast pace for 20 minutes, then cut back onto the river. We figured that would give us that section of the river for the rest of the day provided the Americans behind us didn’t rush things and fished each part of the river as meticulously and methodically as we were. Rowan’s first fish was a rainbow followed by a beautiful Yellowstone cutthroat of 17 inches. Then the Americans appeared and again hit the river right ahead of us. Enough was enough. We headed away from the river and walked upstream at a very brisk pace for 25 minutes. This time we were convinced they wouldn’t catch us. We again cut back to the river after photographing bison at very close range rolling in the dust. There were also loads of pronghorn antelope as well and it was a treat to be right amongst the animals which seemed to have little to no fear of humans. We arrived at a really nice pool that was heaving with rising fish. The rises varied from soft dimples to explosive eruptions which were a clear indication that hoppers were falling onto the water. We proceeded to hook fish of various sizes on almost every cast, and I caught my first ever Yellowstone cutthroat on a hopper pattern. A small feeder stream entered the pool midway along its length and while we were fishing a large trout ate something at the junction of the feeder stream and the Lamar. It was going to be a tricky cast – Rowan had to get the fly across the Lamar and into the junction of the feeder stream and get the fly to sit there without drag. The hope was that the fish would eat the hopper before the Lamar’s currents caught the fly-line and drag set in. Our only hope was a Pile Cast (also called a Puddle Cast) which Rowan executed perfectly on the first attempt – the fly line crossed the Lamar and the leader, tippet and fly piled perfectly. The fly hadn’t been on the water for half a second before a big cutthroat leapt out the water and took the pattern on its way down. We both saw the fish and knew it was the best one of the day. Rowan played the fish gingerly, hoping that the gods would smile on him. It turned out to be a beautiful cutthroat that took the tape to 19 inches – the longest river trout Rowan had landed outside of New Zealand and our biggest fish. The rest of the day was spent fishing dries and nymphs but with little reward. The river looked perfect but we couldn’t buy a fish. Then we headed home and despite our efforts to hitch a lift back to the truck along the main tar road, we were forced to walk the entire distance back to the car without any liquids to drink. We were both pretty tired and couldn’t wait to get back to town for a cold beer. The only occasion that I’d previously seen the Yellowstone was when Tom Lewin, Pieter Page and I had driven to Livingston to fish the famous spring creeks there (Armstrong’s, Nelson’s and DePuy’s) that flow into the Yellowstone. This was probably four or five years back. The Yellowstone near Livingston is a big, wide and slow-flowing river that is best fished from a drift boat. It is not the type of fishing I enjoy having once floated the Beaverhead in Montana. On the way to the Lamar the previous day we’d crossed the Yellowstone and it looked like a super-sized version of the Jan Du Toits River in the Western Cape – just the kind of fishing we like. So the previous night we’d gone back to Blue Ribbon Flies to enquire after the fishing on the Yellowstone. The youngster behind the counter didn’t seem too enthusiastic and I guess in his own was way trying to say, “Why the f*&*k would you want to go there”? But our minds were pretty much set so he suggested a trail into the river that would take us along Blacktail Deer Creek, a tiny stream that held brook trout. It was a four mile downhill hike into the river and the banter was how difficult the hike out was going to be! My idea was that the Yellowstone would be something similar to what we had seen on the way to the Lamar the previous day, but that changed when we arrived at a suspension bridge crossing the river! It was abundantly clear that once we decided to fish one bank that would be the bank we would have to stay on all day. The Yellowstone, even during its lowest flow in August, was a thundering maelstrom. The river was broad – probably sixty to eighty yards across in places – and was very deep and exceptionally fast flowing. The flow rate, according to a board outside one of the fly-shops was 1200 cfs. The only solution was to going to be to nymph the margins and fish dries, also along the margins. Row moved into the relatively shallow tailout of a fast run, while I hit the upper section of the run. The water I chose to fish was exceptionally fast and deep and the solution was to fish a heavy tandem nymph rig with split shot. The only indicator that was going to float all this was a ¾“ Thingamabobber. It wasn’t going to be pretty fishing, but there was no other solution. I started nymphing the hole and deep run directly upstream of my position and after twenty minutes or so had my first hook-up. The fish was on for maybe five seconds, then it was gone. Cursing my luck, I continued nymphing a hole just off the thundering main current and I again hooked up with the same result – the fish again unbuttoned itself. After losing five fish out of the same hole I started to have a sense of humour failure and let Rowan know about it with a whole bunch of cursing. Then finally I hooked the sixth fish solidly and when I first saw it I knew why I’d been hooking and losing them: they were Rocky Mountain whitefish! These are salmonids indigenous to the Rocky Mountain area and have tiny mouths – even smaller than grayling. The one I landed was hooked just outside the mouth, as were the next two I landed. By now Rowan had ventured upstream and was fishing a hopper along the margins, and although he rose some fish, he failed to connect. Early in the afternoon we decided to cut our losses and headed home. Now we were faced with a long, uphill slog out of the Yellowstone canyon which took close to two hours, broken with numerous water breaks. While it was great to fish a new river, we’d clearly made a mistake, but life is here to teach us these little lessons! The Henry’s Fork of the Snake, officially the North Fork of the Snake, is one of America’s premier trout streams. It has its source from Henry’s Lake and Big Springs Idaho. At Big Springs the water literally boils from the earth and starts flowing downhill to form the Henry’s Fork proper, and no fishing is permitted in this area. The river is 127 miles long and flows through south-eastern Idaho. It is the world’s largest spring creek and there is only one word to describe it: iconic. 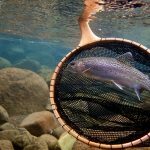 When you fish the Henry’s Fork, and specifically the waters that flow through the Harriman State Park, you are walking along banks and wading currents in the footsteps of fly-fishing’s giants like Ernest Schwiebert, Andy Puyans, Doug Swisher, Carl Richards and hundreds more fly-fishing giants. It is difficult to describe the feeling when you see this river or step into its currents. And no matter how many trips you make to this magnificent piece of water, that feeling will never leave you. Words defy me trying to describe the feelings and emotions when I entered the river’s soft, clear currents. Rowan and I took a leisurely drive south from West Yellowstone to Island Park, our base on the river for the following three days. We drove straight to Rene Harrop’s Trouthunter on the Henry’s Fork to purchase our State licences and to stock up on those “killer” patterns that are a must for this river. Yes, I have boxes of my own flies that I tied for this river on previous visits, and while I hate fishing bought flies, the quality and selection available from fly-shops in the States defies belief. Then we headed to the Anglers’ Lodge to check in our gear and prepare for our first afternoon’s fishing. The guides at Rene’s shop had told us to give the area just below the shop (Harrop’s Lodge/shop is located right on the bank of the river), so we unpacked, tossed gear into the truck and headed for the parking area just south of the shop. Now before going any further, a little history lesson is necessary! There are many famous stretches of the Henry’s Fork, including the Box Canyon, just north of the settlement of Last Chance. The “Box” is best fished from a drift boat and due to the nature of the water, is famous for its hatches of massive stoneflies (Pternonarcys californica), also called salmonflies. Nymphs and adults are usually imitated by imitations tied on #2 and #4, 4x-6x long shank hooks. Once the river leaves the Box it smoothes out into a giant spring creek that is sometimes 100 yards wide and is easily wadeable across its length in the upper reaches. Just below Harrop’s shop the river enters the Harriman State Park, or, as it is known to most fly-fisherman, the Railroad Ranch. The Ranch was owned by the Harrimans, a super-wealthy American family who made their fortune building railroads across America (hence the name “Railroad Ranch”.) The Ranch is 11,000 acres in extent and has 8½ miles of the Henry’s Fork flowing through it. It was used as the Harriman’s summer holiday retreat and their ranch buildings are clearly visible on the banks midway along the 8½ miles of river. In 1976 the Harrimans bequeathed the Ranch to the American public with the proviso that it was to be properly managed. 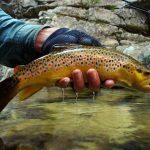 The Ranch waters are the waters of the Henry’s Fork that attract anglers from all over the world, and with good reason. Its hatches are prolific and you can almost set your watch by them. The rainbows in the river, no matter their size, will frustrate you beyond belief with their selectivity. The river is not called “The Final Exam” without good reason! On our first afternoon, while tackling up in the car park at an area of the river known as the Logjam, a familiar figure arrived, left his dog in his truck and walked out to the viewing platform on the river bank. On his return I walked over to him, introduced myself and then introduced Rowan. It was none other than Rene Harrop, whom I have met on several occasions before, mostly at the IFTD show in Denver. A more humble and nicer human being you will not meet. After saying goodbye we headed down to the river, but our first afternoon was largely uneventful and we hooked no fish and in fact saw few fish rising. We did, however, see a small hatch of large Gray Drakes hanging over the water’s edge and managed to catch a few. These would be imitated on hooks as large as #10s and #12s. They are pretty insignificant to the trout as the nymphs emerge at the bank, but it was good to see an insect species I’d never seen before. The following day we headed down to the ‘Mailbox” which is exactly what it is – a mailbox on the side of the main road heading north to West Yellowstone. We tackled up, shrugged on our waders and headed down the road to the river. That little “walk” took us 17 minutes which was no problem in the morning. That same walk home in the afternoon, however, was to turn out to be a most unpleasant experience given that I had on a pair of Simms Guide Fleece pants under my waders. I could literally wring the sweat out of them once we reached the truck after our day’s fishing! After posing for photographs on the bridge that crosses the river, we headed downstream towards the Harriman’s old holiday houses. The pool on the big bend of the river in front of the Harriman’s houses is appropriately named ‘Millionaires’ and it was just upstream of this area that we decided to start fishing. Now there is a simple protocol when fishing the Ranch. There is little to no blind fishing unless you’re prospecting the water during the heat of the day with hopper patterns. We’d arrived early before any hatches started so it was a question of waiting on the banks for something to happen. During August the first insect that will start hatching are Tricos (Tricroythodes minutus). Generally these tiny mayflies will start coming off around 9am. As duns they are of no relevance to the trout as they emerge exceptionally quickly and take off immediately. Their real significance is when the spinners start falling. Initially there were just a few duns in the air, but within half an hour there were clouds of mating duns wafting up and down along the banks and then the spinners started to fall onto the water. The odd fish started rising but soon they were rising everywhere and the frustration started. Fishing #22 spinner imitations is one thing, but getting them to drift drag-free on the currents of the Henry’s Fork is another! And then trying to track these tiny, flush-floating imitations in the film – well that’s another matter altogether! While I’m on the subject, I think it’s important for readers to understand how anglers fish the flat currents of the Ranch waters. There is literally NO upstream fishing of any sort here. Almost every cast you make is almost directly downstream to a visible (rising) trout. You need to position yourself almost, but not quite, directly upstream of a working fish. You stand upstream and just off to the side of a fish and cast downstream to it. The cast is a combination of a Puddle/Pile cast and a Parachute Cast. So this is how it works. You aim your casts at about a 45 degree angle above the water’s surface and under power the cast on the forward stroke. This is the Puddle/Pile cast portion and will cause the leader and tippet to land on the water in lazy, serpentine curves. Then as the line is turning over, you bring the rod slowly back to yourself in a vertical position so that the line hanging out of the tip guide rests against the rod. Then as the currents grab the fly-line as the line, leader and fly drift towards the fish, you slowly lower the rod tip until the line tightens up. By doing so you gain, at maximum, a drift of perhaps 9 feet. Nothing more. The trick is to get the fly to land a foot or so above the fish. Once the fly drifts over the area where the fish has risen, you have perhaps another two feet of drag-free drift before drag sets in. What you also have to bear in mind is that the fish is holding upstream of where you see the fish rise, because fish generally drift downstream and upward to take a surface insect. You can also extend the drift by shaking line out of the rod tip as the line drifts down to the fish. There is a reason why anglers fish this way on the Ranch’s flat waters. Firstly, it is the best way to ensure a drag free drift. The Ranch waters are filled with weeds which send currents up the surface that push left, right, down and, relatively speaking, upstream as well. I’ve often cast across and upstream on the Ranch just to watch what happens. No matter what casts you try (Curve Casts, Serpentine Casts etc), those minute currents grab the fly line, which in turn pulls the leader and fly along with it. Your fly comes drifting downstream like a zig-zagging motor boat and no self-respecting trout will humour you by eating it. The second reason anglers fish downstream is simple: the fly drifts into the fish’s field of view before the tippet. I’ve used this cast quite often on the Vaal when I’ve found fish feeding downstream of my position and it is very effective. Row and I frustrated ourselves no end trying to deceive rising fish during the Trico spinner fall, then as quickly as they had started, the fish stopped. The spinner fall was over and the fish stopped rising. Then at 10.30, caddisflies started hatching and the fish got busy on the top again. More frustration! Then Callibaetis mayflies (Callibaetis coloradensis) started emerging and shortly thereafter the spinners started falling. Relatively speaking these are large mayflies (#14 – #16) and I eventually fooled a rising fish on a spinner imitation tied with Polypropylene wings. This was the first fish I have ever hooked and landed on the Ranch waters over three trips! Eventually Rowan also fooled a fish, but neither his, nor mine, were anything to get excited about. By now it was midday and there was nothing emerging (and therefore nothing rising) so we decided to walk upstream and fish above the bridge. It was a wasted afternoon because the water above the bridge was warm relative to the water downstream and eventually we called it a day and headed for the truck and a nice, cold Fat Tire beer at the Anglers’ Lodge. We popped into Rene’s trout shop and asked Tom, a most helpful guide who works at the counter, what we should do the following day. He suggested we fish the Osborne Bridge area, then to head out to the Wood Road #16 area in the afternoon. The following morning we headed for Osborne Bridge, parked the car and walked downstream towards a large island in the river. The night before had been a little colder than the previous night so all the hatches were delayed. It took a while before the Trico spinners started falling, but when they did I managed to rise and hook two very nice fish on a #22 Trico spinner. Both fish tore away downstream and in both cases the hook pulled free. It was most frustrating particularly as the first fish seemed heavy. No matter, fishing is not only about the catching (or landing) fish, but as much about the fishing itself and I was having the time of my life. I managed to rise another three fish, but for some reason (and I’m assuming it was drag on the fly) they refused, their only presence being an upwelling of the water beneath the fly. The most amazing thing about all this was that there was not another angler in sight. Rowan also almost managed to photograph a fish rising near the bank, but his shutter went off just too late to get the fish sticking its entire head out of the water. At midday we packed up, walked to the truck just upstream and headed to the famous Wood Road #16 area. There were other anglers upstream of us, but on the Henry’s Fork this is never an issue given the length and width of the river. Afternoon hatches in August include tiny Baetis mayflies (Baetis parvus, Baetis tricaudatus and Baetis punctiventris) in #20 – #24 and Pale Morning Duns (Ephemerella infrequens) in #18 and #20. There are also falls of hoppers as well and black- and cinnamon winged ants. There were fish rising rhythmically just about everywhere and some of the rises were unmistakably those of decent fish. Row and I waded in and picked out a fish to target. Now the problems started. Firstly, what were the fish eating? Secondly, what stage (i.e. subsurface nymph, emerger, dun, stillborn, cripple, spinner etc) of the insect’s life cycle? Thirdly, how are you going to get drag free drifts over these fish? And finally, the wind was gusting, often blowing your cast off course. After throwing several Baetis and PMD imitations at various fish, I took at look at the water’s surface and spotted some black flying ants drifting in the film. I clipped off the fly I was using, tied on a winged black ant and targeted a very nice fish that was cutting across the current, showing its entire head and back. It was coming to the surface every ten seconds or so and it looked very catchable. I waited until I thought the fish was due to rise and made a cast. The ant sat up nicely on the water, its white CDC under-wing easy to see in the afternoon light and I just knew that the cast was perfect and on the right drift line. Sure enough, up came the fish and I tightened up only to have the line, leader and fly come concertina back at me. “F$#@&*%$k”! I let every angler in the area hear about my ineptness. Five minutes later, again using the ant, I rose and pricked another good rising fish, only to have the line come shooting back at me again. By now I was swearing and cursing the fishing gods while Row was having a silent chuckle to himself downstream. But then Row started getting frustrated and eventually got out of the water and went to sit on the banks to calm his nerves. 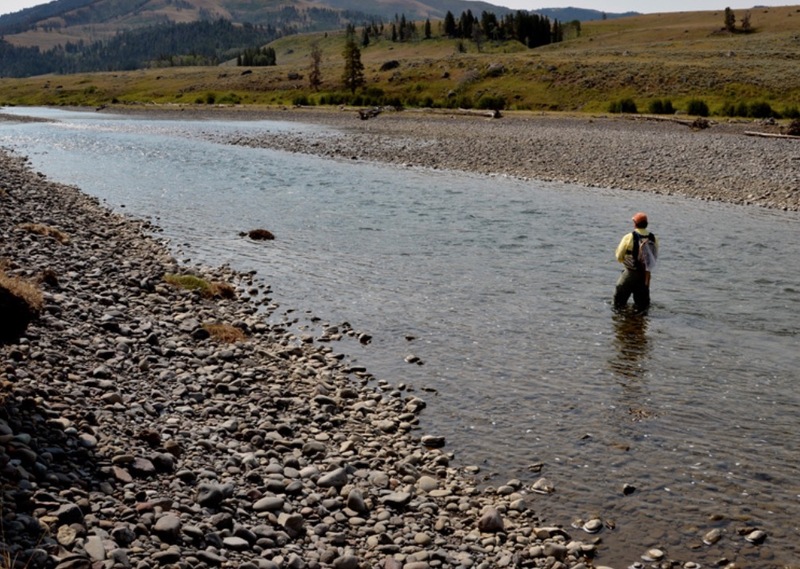 Such is the fishing on the iconic and most beautiful of rivers, the Henry’s Fork. But to quote Arnold Schwarzenegger, “I’ll be back”. Before ending this article I’d like to add a story of an incident on the Henry’s Fork that happened while Rene Harrop and Mike Lawson were fishing together. Mike, for those of you who don’t know, is a famous American angler/author who owned The Henry’s Fork Angler in Last Chance Idaho. This incident comes from a book co-authored by the late Gary Lafontaine and Mike titled, Fly Fishing the Henry’s Fork. My copy is in storage at the moment, so I’m writing this based on memory. Rene and Mike were fishing during a hatch of small bugs – probably Baetis or PMDs. Mike was fishing a small pattern, a #20 or #22 if memory serves me correctly, and hooked and lost a respectable, but not huge, fish, around 16 inches. An hour or so later Rene had worked his way downstream of Mike’s position and hooked and landed a fish. Holding the fish out of the water in his net, he beckoned Mike to come down to him. Mike could see the fish in the net wasn’t of any significant size and was puzzled why Rene was asking him to come over. All was revealed. Rene had hooked the same fish Mike had hooked and lost. Nothing significant about that. It’s happened to me several times over the more than 30 years I’ve been fly-fishing. So what was so significant about this incident you ask? Rene had also been fishing a tiny fly and his hook had penetrated the eye of Mike’s fly!